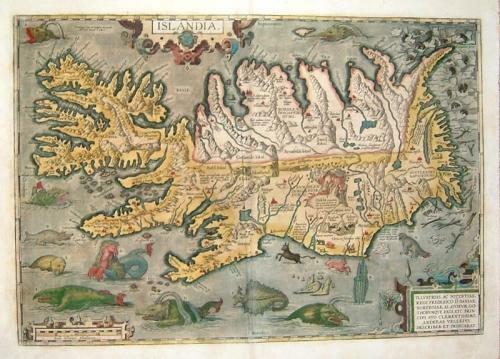 Title: 'Islandia' from the Theatrum Orbis Terrarum. A classic map of Iceland with the volcano Mt. Hekla exploding, polar bears on ice floes, and the oceans around filled with sea monsters. - the side margins have been repaired using matching paper across much of their length. The map has not been remargined as such - the original margins are there and have had matching paper integrated to replace some chips. There is an area (approx 3 x 1.5 cms) at both lower corners where there has been a total replacement using the above process. - There is a centerfold crease that has been pressed out (visible in the image). - The centerfold has been repaired at top and bottom (a few cms in the margin). The map is very presentable and the above list of repairs is exhaustive. All work has been performed by an expert who does much work for the London museums. The price has been adjusted accordingly. Ref: Van den Broecke 161.